Hōkūleʻa is scheduled to depart the Haleiwa Boat Harbor for Hanalei Bay, Kauaʻi as part of the Mahalo Hawaiʻi, Sail. Crewmembers are preparing to set sail tomorrow afternoon at 2:30 p.m. and arrive to Kauaʻi the following morning that will include a public arrival ceremony at 10 a.m..
Recognizing their global quest to share Hawaii’s sustainability message, Malama Honua and the crew of the Polynesian voyaging canoe, Hokulea, will be the honorees of the 2017 Global Tourism Summit at the Tourism Legacy Awards Luncheon, September 19. Over a three-year period, from May 2014 until its triumphant return to Honolulu on June 17, 2017, Hokulea’s crew circled the world sailing approximately 40,300 nautical miles, stopping in more than 150 ports, and visiting 23 countries and territories. 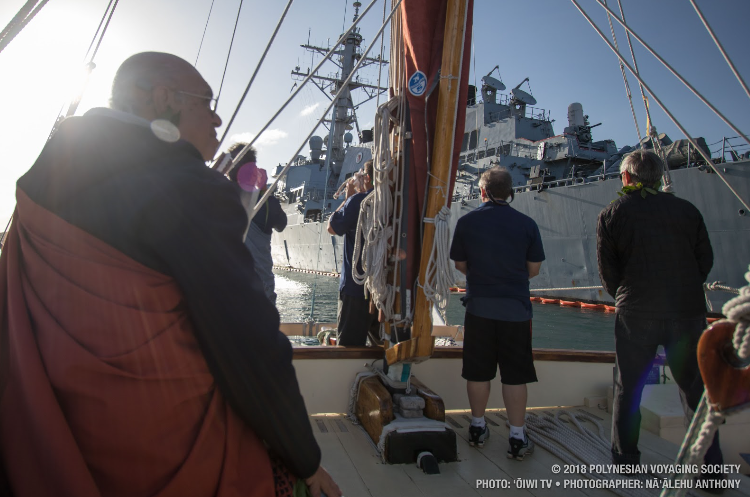 In completing Malama Honua (which means “to care for our Earth”), Hokulea’s crew shared its message worldwide on the significance of perpetuating native cultures and protecting natural resources, especially the ocean environment. Presented by the Hawaii Tourism Authority (HTA), the three-day Global Tourism Summit takes place September 19-21 at the Hawaii Convention Center. The Tourism Legacy Awards Luncheon is a highlight event of the opening day. The festive luncheon in the Center’s ballroom will feature live music, a video tribute to the worldwide voyage of Holukea, and remarks from Master Navigator Nainoa Thompson of the Polynesian Voyaging Society. Attendance to the Tourism Legacy Awards Luncheon honoring Malama Honua is included as part of the registration to the Global Tourism Summit, which is available online at the dedicated summit website, www.GlobalTourismSummitHawaii.com. Several options are available for registration, including early-bird savings being offered to individuals and groups attending all three days of the summit if they register by July 31. Sustainable tourism is the theme of the Global Tourism Summit. The significance of the Hawaiian culture, global marketing, technology and innovation will be shared in presentations and panel discussions, with the overall intent to bring people together to improve tourism in Hawaii and abroad. Previously known as the Hawaii Tourism Conference, HTA changed the name of the annual event to the Global Tourism Summit to more accurately reflect Hawaii’s emergence as a leader in international travel and tourism. A dramatic image of the Polynesian voyaging canoe Hōkūle‘a sailing around the South African coast has earned Hawaiian Airlines’ in-flight magazine HanaHou! a prestigious gold prize from The American Advertising Awards (ADDY). At 12:30 p.m. this afternoon, the crew of Hokulea sited the sacred mountain of Haleakala, signifying that the legendary canoe is officially back home after sailing for 37 months, 40,000 nautical miles and visiting more than 150 ports in 19 countries around the world. After spending 400 days at sea and 700 days on foreign soil, Hokulea will be bringing home wisdom, lessons and ideas as gifts to share with Hawaii’s children from this voyage of rich learning. This tremendous voyaging accomplishment was a fitting way for the crew to celebrate World Oceans Day. One year ago today, Hokulea was in New York at the United Nations to participate in World Oceans Day dialogue about the importance of protecting Island Earth – especially the seas Hokulea has sailed throughout the world these past three years. “I also want to express our gratitude to the crews of the 30 other legs and the thousands of people in Hawaii, the Pacific and around the world for allowing this voyage to happen. We are grateful for all that they have given to the success of the voyage,” Thompson added. 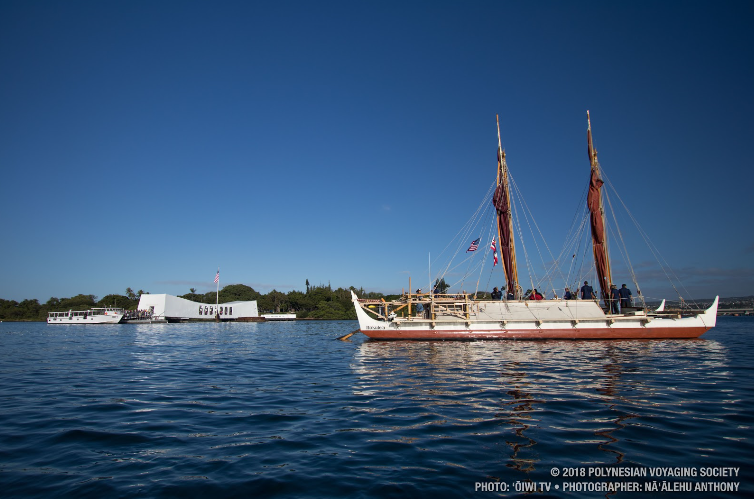 Although Hokulea and Hikianalia are in home waters, the canoes are still under kapu until the arrival ceremony at Magic Island on June 17. “We will be spending the next week slowly making our way towards Oahu,” said Thompson. 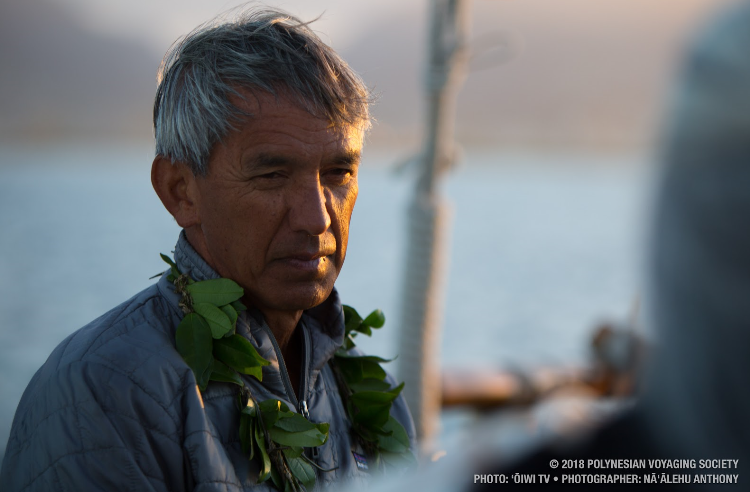 “We appreciate the aloha and support of friends and families eager to greet our canoes and crew, and we ask for your patience and understanding as we direct all those interested in greeting Hokulea, Hikianalia and our crew to our June 17 arrival at Kalia (Magic Island), Oahu,” he added. After returning to Oahu, Hokolea and Hikianalia will begin the most important leg of the voyage, which will be an eight-month sail to 30 ports throughout the Hawaiian islands. “When we sail throughout the Hawaiian Islands, we will go to as many as 70 communities and 100 schools to thank Hawaii’s people and share what we have learned with their children. We are also looking forward to hearing Hawaii stories of Malama Honua,” said Thompson. “Kalia (Magic Island) is the first stop of a year-long homecoming,” he added. Legendary voyaging canoes Hokulea and Hikianalia are approaching the Hawaiian Islands after three years at sea. 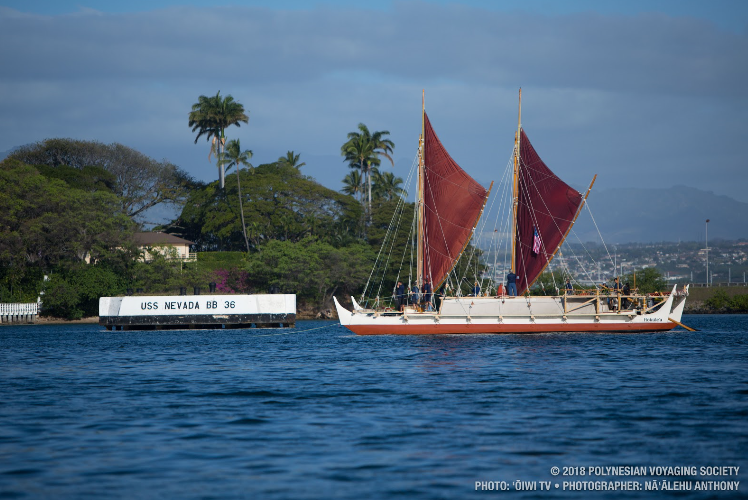 Given that Hokulea and Hikianalia are dependent on nature, a two week window was created to ensure the canoes arrive on time to meet the love, support and aloha of Hawaii. The two-week window also allows crewmembers to visit three very special sacred sites in Hawaii: Kahoolawe, Kalaupapa and Kualoa. There, the crew will pay respect to the culture, environment, history and heritage. These sites will be the last ports of the Worldwide Voyage and act as the final permission that allows Hokulea to come home and finish the epic voyage. 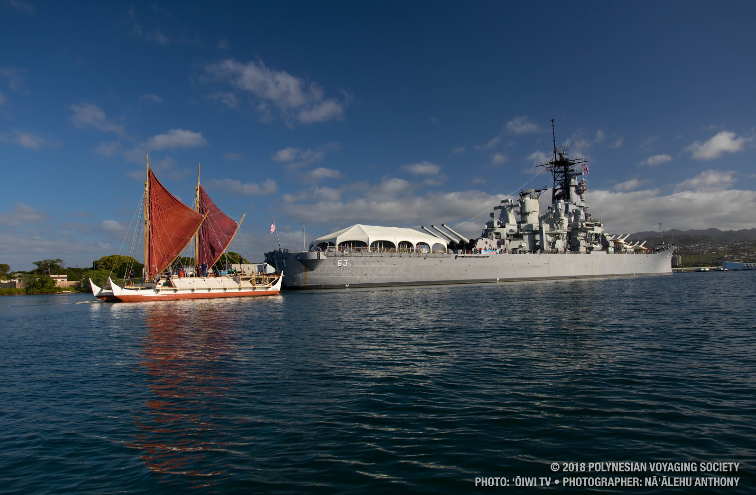 Hokulea was launched from Kualoa; on the return leg of her maiden voyage, from Tahiti to Hawaii, the first place she anchored back in Hawaii was at Kalaupapa. 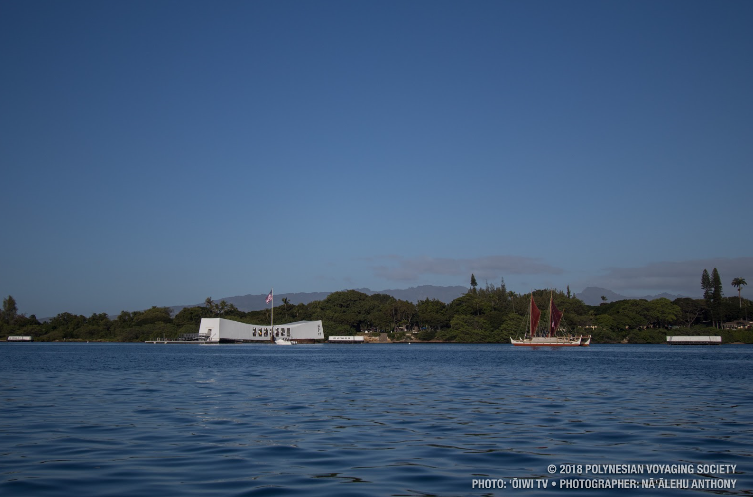 These are spiritual and deeply important places for all people in Hawaii and Hokulea crewmembers will be paying respect to them with a private ceremony. Thousands of people have been working over a year to celebrate the completion of the worldwide voyage. 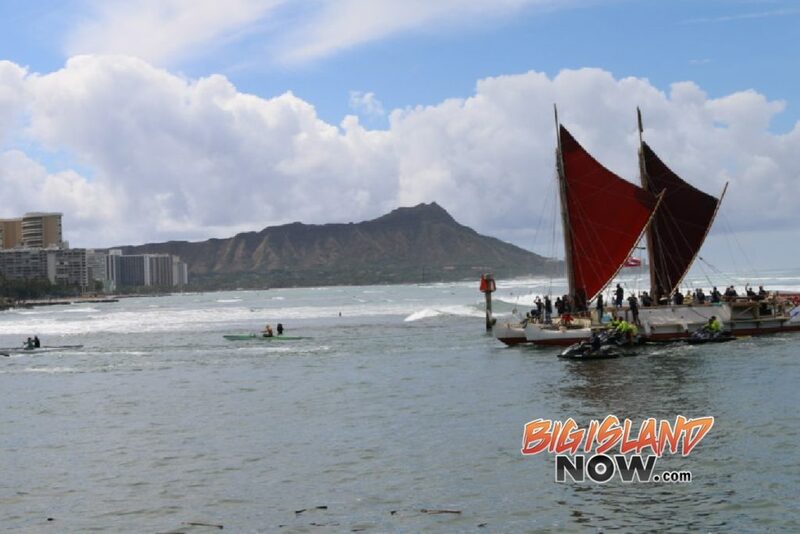 Hokulea will be welcomed home to Oahu on June 17 at Magic Island, with a grand public celebration and ceremony followed by community Hoolaulea later in the day. The Malama Honua Fair and Summit, held at the Hawaii Convention Center, will extend the celebration through June 20. The crew of Hawaii’s legendary Polynesian voyaging canoe Hokulea yesterday departed from Rapa Nui as they continue on their Malama Honua voyage and head to Pitcairn. Hokulea returns to the Pitcairn Islands for the first time since her voyage in 1999, when the canoe sailed around the Polynesian Triangle. While in Rapa Nui, the crew worked alongside the Nahiku Student Delegation to help fulfill the mission of the Worldwide Voyage by connecting with the local community and representing Hawaii. The Nahiku Student Delegation and Hokulea crew activities included meetings with both the Governor and Mayor of Rapa Nui, a visit to the Kupuna (elders) of Hare Koa Tiare Care Home, and a tour of Museo Rapa Nui. Hokuleawas honored with a traditional landing ceremony on Anakena Beach, the site of historic seafaring welcomes for the small island community of Rapa Nui. The Pitcairn Islands are a cluster of volcanic islands and atolls in the southern Pacific Ocean forming the last British Overseas Territory in the Pacific. The area around Pitcairn Islands is one of the most pristine places on the Earth. Following Pitcairn, Hokulea will head to the Marquesas Islands and to Tahiti, where she will be greeted by the local community in mid-April. From Tahiti, the crew will continue their journey home to Hawaii and will be welcomed at Magic Island, on June 17, 2017.